But maybe it is just because the current version of the Inquititor has changed this. As you see at the bottom of the dialogue, its telling about this. But as everyone will download the current version you probably should change this in your above manual. Also the "add" button is just a "+" button as seen above. I just upgraded to Safari 5.0 and noticed it is not fully compatible with the current release of inquisitor. 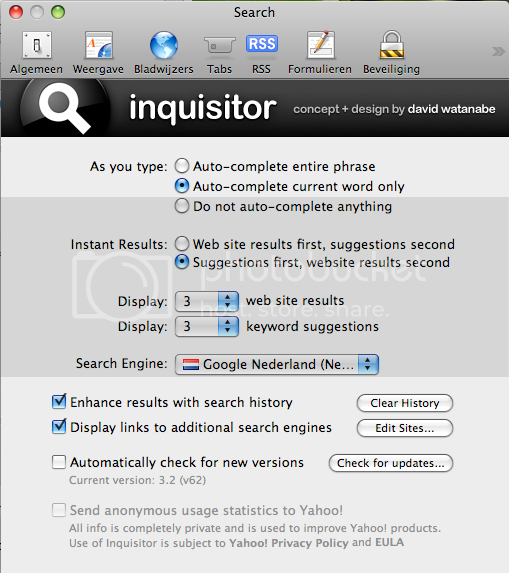 Under Safari 4.x you got the inquisitor search menu instead of Safaries own menu, but with 5.0 you get both simultaneously, with Safaries search field own on top. 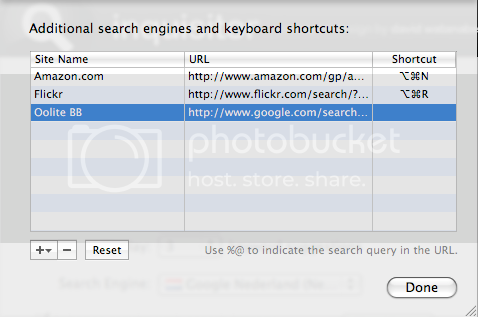 There is another way of doing it with Mozilla browsers using a custom keyword for a bookmark. 2.Right click and select "New Bookmark"
EDIT: without the quotes, unless you want to type: ool "pulse lasers" , which works and has slightly different behaviour from: ool pulse lasers . This has been around for a long time on Firefox so I wouldn't be surprised if it works on Safari, IE, Opera and Chrome. El Viejo wrote: Heh, yeah... it ain't the best. Use Diziet Sma's search plug-in... that works a treat! Hm, with Google I can not search "in topic titles only", "in expansions forum section only", "by user:someone" and such. And I usually am useless at narrowing things down from a million hits to the dozen I was hoping to find. Though strange enough - both searches have the topic I was actually looking for listed as 4th result. Hm, maybe it is time to switch to the dark side(s). * pro-tip : do not dump Larry's favourite goddaughter after the 1st date. Interesting. When I type your search I also get 1800 results. But when I use the search button for a google search on this site it produces the following search request: "+energy +bomb site:http://aegidian.org/bb/" with only 1620 hits. The difference is in the '*' symbol in the http. But are there pages on this site not on http? Anyhow, for safari 5.x there is now a 'custom search' extension that is very user friendly and certainly worth installing. snork wrote: Does someone have an idea why this topic is not found when I do a search for energy bombs (search for all terms, all forums, in topic titles only) ? It's the very first result. Note that the results are usually listed in reverse order of post time (newest result first), so you may have to browse through a couple of pages of results in order to find a thread which has not had a post in almost two years, especially if the search words are being used quite frequently. For instance, other than your own new posts, the "On energy bombs" thread first pops up on page 9 of the search results. Personally I have never used anything but the in-built board tool for searching, and I've usually found everything I was looking for. So I can't say that it's utterly useless for me. If I would wish something for improvement, I'd say that the "Post subjects and message text"-option be replaced with "Topic titles and message text". That would in this case have found the latest post in the thread, not only the last post which also had the search words. I have never used the subject line in a post myself, and I have made a fair number of posts. Usually it contains the topic title in these cases, but then a direct search in the topic title would still make more sense. Eric Walch wrote: The difference is in the '*' symbol in the http. But are there pages on this site not on http? I only put the * so the board would not make a clickable link from it. Sorry, I did not mean to confuse anyone with this. Commander McLane wrote: This I don't understand. If I do this [...] It's the very first result. The more general the searchterm (e.g. energy), or the more likely to appear in topics that do not focus on the searchterm subject (e.g. Griff) the more I like to search in "Topic titles only". In the hope to find the official topic for some oxp for example, and not every other "what oxps do you recommend" topic. And this searching "Topic titles only" does not work in this case. Usually I do find the topics I want to find with this option. On the occasions when I've actually remembered to use the plugin, it's worked very well indeed. With a google search I get 5520 hits and all contain the exact wording. That google find more hits that the internal search also means that a lot matches are missing despite the addition of a lot of junk matches. Ditto I always have trouble finding that gnustep defaults setting that flushes the cache too, every single time . . .
m4r35n357 wrote: I always have trouble finding that gnustep defaults setting that flushes the cache too, every single time . . .
That's the feller - let's just hope I remember the phrase next time Is it linked from anywhere? m4r35n357 wrote: That's the feller - let's just hope I remember the phrase next time ;) Is it linked from anywhere? Does anyone know how to use the plugins for Chrome? Try as I might, I can't work out how to do a search.